Home » ★★★★☆ » Portland and yes it is (mostly) Great. Portland and yes it is (mostly) Great. #Firstworldproblems no 1: being irritated by the OpenTable booking message telling me I can only have the table for a two hour slot. #Firstworldproblems no.2 : being called by the restaurant two days before the booking, to remind me about the two-hour slot, in case I hadn’t seen it on the screen during booking, not to mention the email confirmation I received subsequently. It’s one of my particular bugbears, the two-hour table slot. Little are they to know that I eat my food at warp factor ten. In the land of quick eaters, I am queen. I’m not proud of it and I do sort-of chew my food, but in my excitement to taste absolutely everything, I am afraid that there is a little speed greed. Unless I have been sucked into tasting menu torture, spending more than an hour in a restaurant is a major accomplishment and so I never actually worry that I will breach the two-hour deadline, but I don’t ever want to be watch-watching. But here, we had plenty of time to eat dessert and much else. This was my second visit, the first having been a solo outing. I have toyed with solo dining, the advantage of which is that I can concentrate on the food in a peace and quiet sort of way. It’s a different experience to eating with others and the interaction with the waiting staff is often more interesting. What I gain in concentration though, I lose in variety, not being able to fork the food off everyone else’s plates. Unlikely to be a regular feature then. A foodie favourite within minutes, everybody was talking about it. There is a special ingredient for some new openings which acts like a magnet. It will do no harm that your father is Nicholas Lander, and your mother Jancis Robinson. 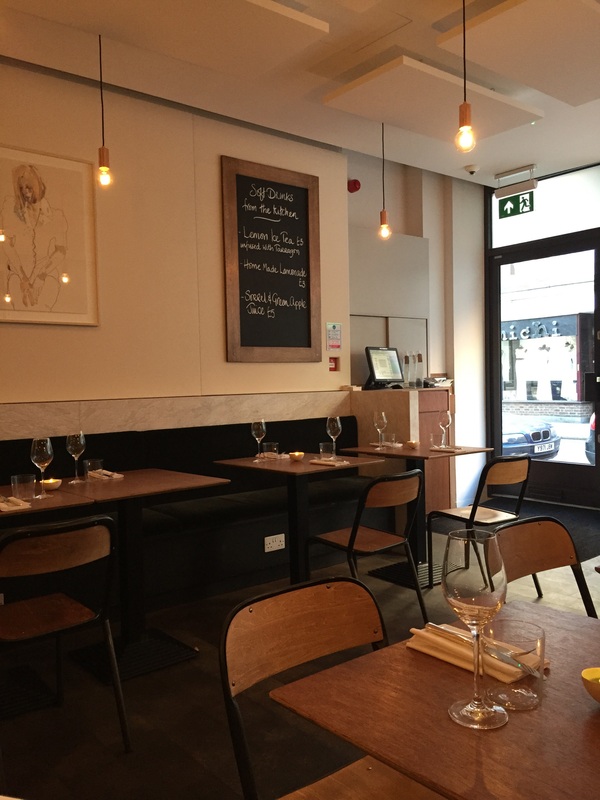 I like the whole set up here, the sparse decor, the wooden school chairs, the bare filament lightbulbs – you get the idea; yet another Hackney moves west restaurant. I am not sure that I am so keen on the jars of unrecognisable vegetables arrayed on the back shelf, the contents in various stages of pickling, like a school chemistry lab. 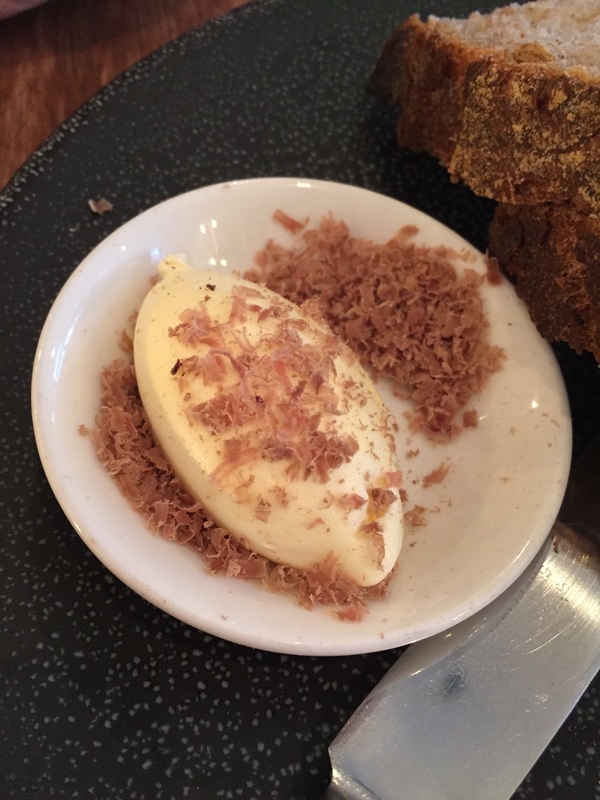 My first visit brings good bread, repeated on the second visit and accompanied by butter topped by shaved ox heart, like grated truffle, the slight revulsion at the eating of which I ignore, because it tastes so damned good. 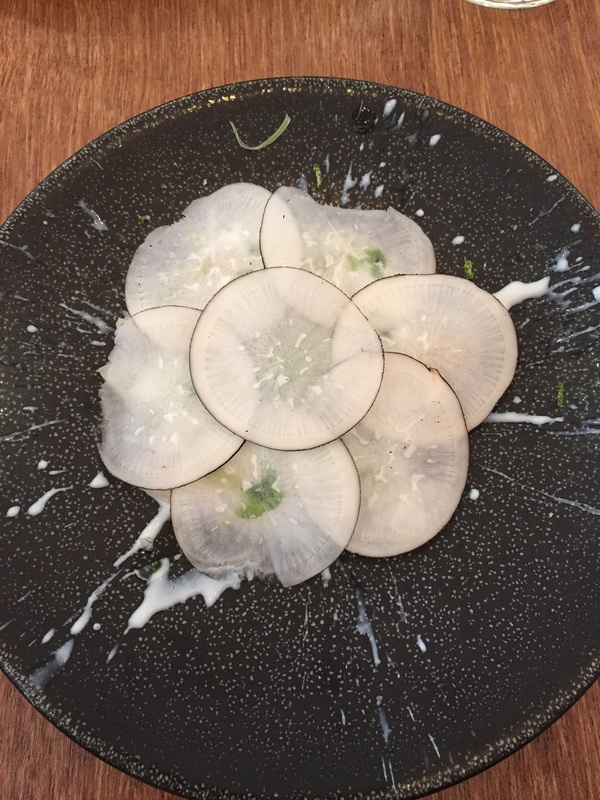 Highlights of that meal are the ultra-fresh turbot, white asparagus and samphire and the creamy ceviche scallops, in a limey buttermilk, with a blanket of with ultra-thin radish discs and a sort of star pattern of buttermilk splattered over the plate, as if a bomb had been dropped. A side dish has to be returned as it is too salty. 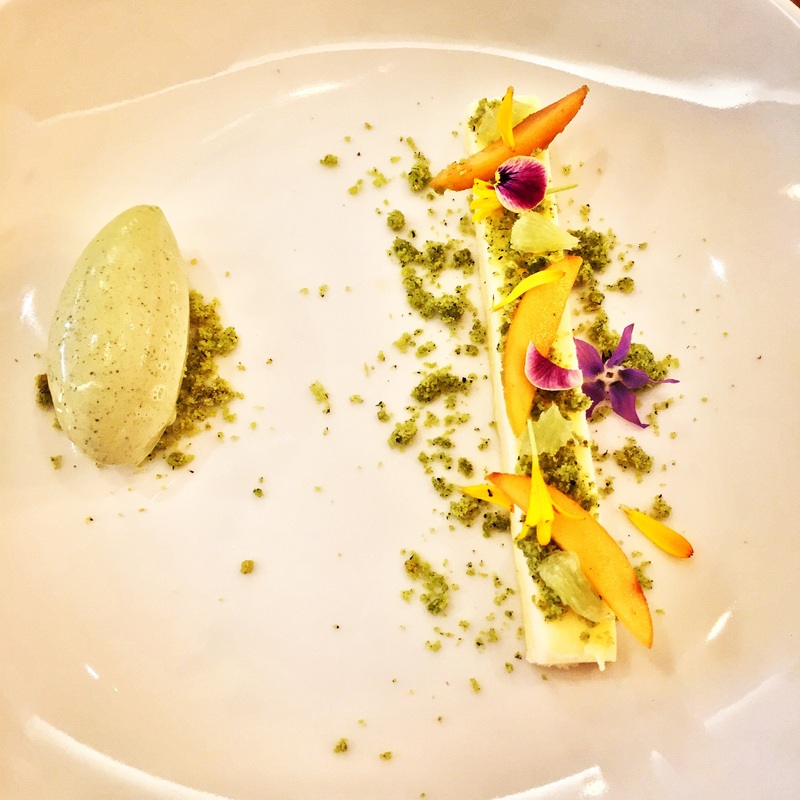 The meal is also let down by the dessert, the yuzu curd with green tea ice cream, which is unexpectedly cold and in my opinion the worse for it. I see on my subsequent visit that they describe it as frozen. Having not been completely blown away by my first visit, I decide to return with a jetlagged C and taking advantage, I suggest that we share the starters. As he is distracted, he agrees. 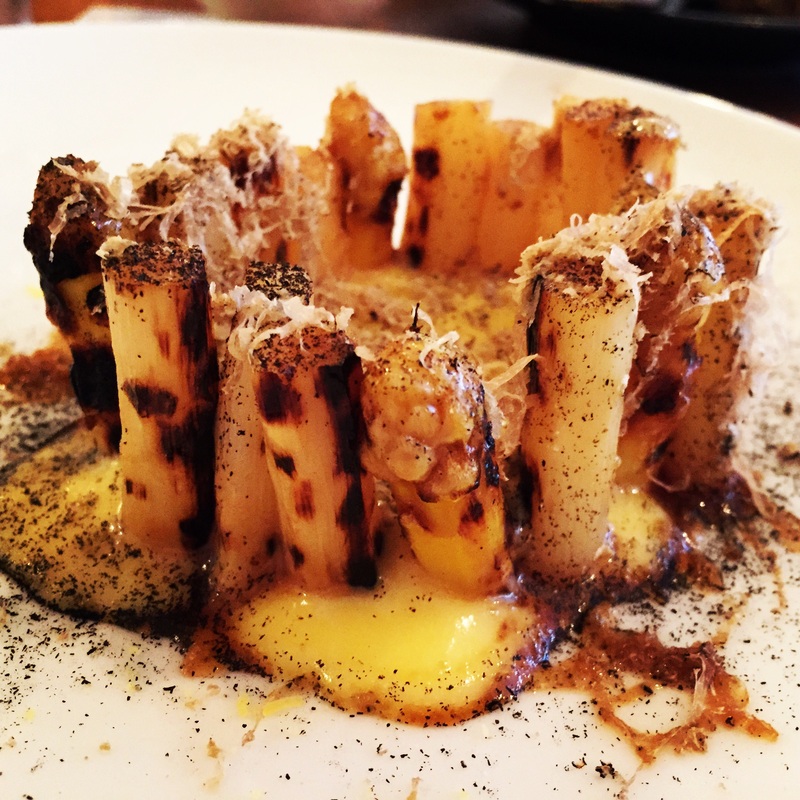 Typically, this is the only time when I really do not want to give away my choice of starter, the barbecued white asparagus, smoked hollandaise and summer truffle. Like a little crown, short spears of chargrilled asparagus stand upright, keeping guard over a gooey, rich hollandaise which seeps out, slightly burnt and crisp at the edges, dusted with truffle and what appear to be the softest gratings of Parmesan. Simply spectacular. C’s bonito, sesame and pickled seaweed does not stand a chance against that umami bomb, pretty though it is. 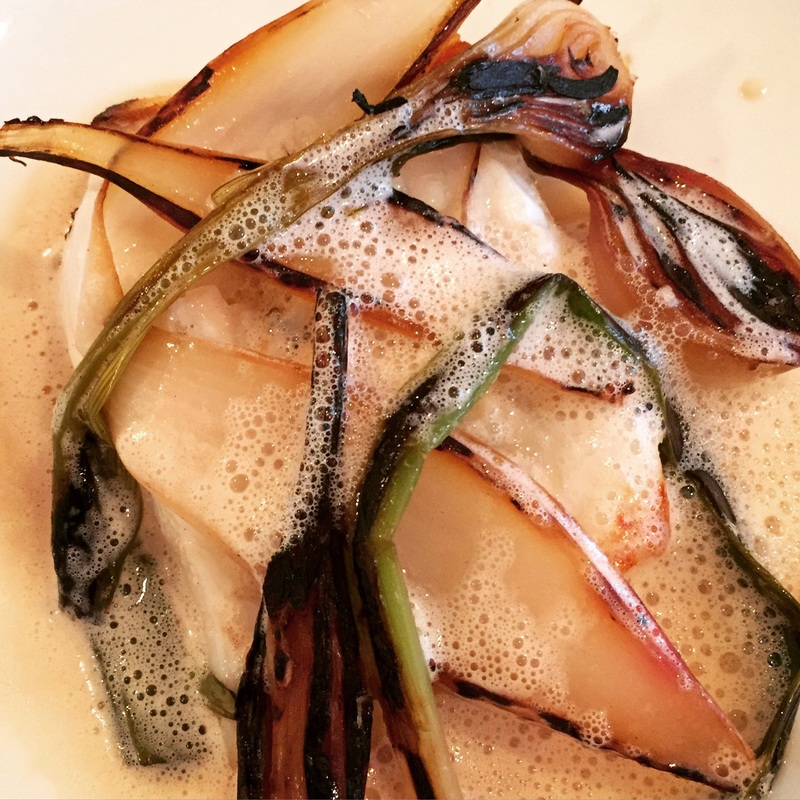 I do not resist the turbot, this time prepared with tropea onions, cider and brown butter (£30). 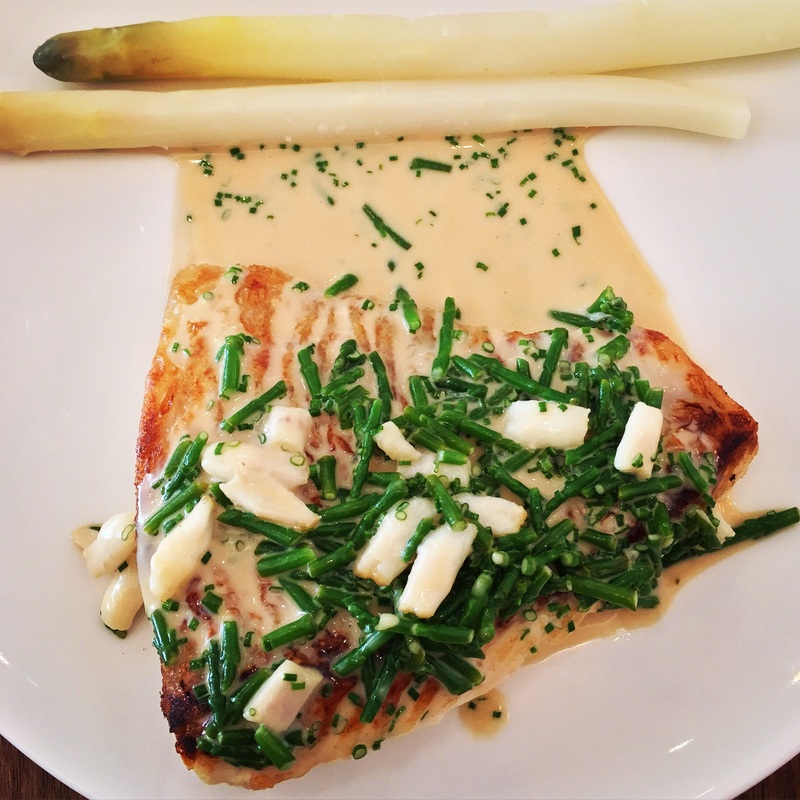 Wilted spring onions drape themselves alongside sweet sliced onions, covering the perfect turbot, the onions charred at the edges and a foamy cream sauce adding the final layer of flavour. Again, not a foot wrong in this dish, all sweetness, depth, subtle charring and cream. I am afraid that I am not able to resist the call of the entirely unecessary side dish of crispy potato millefeuille. 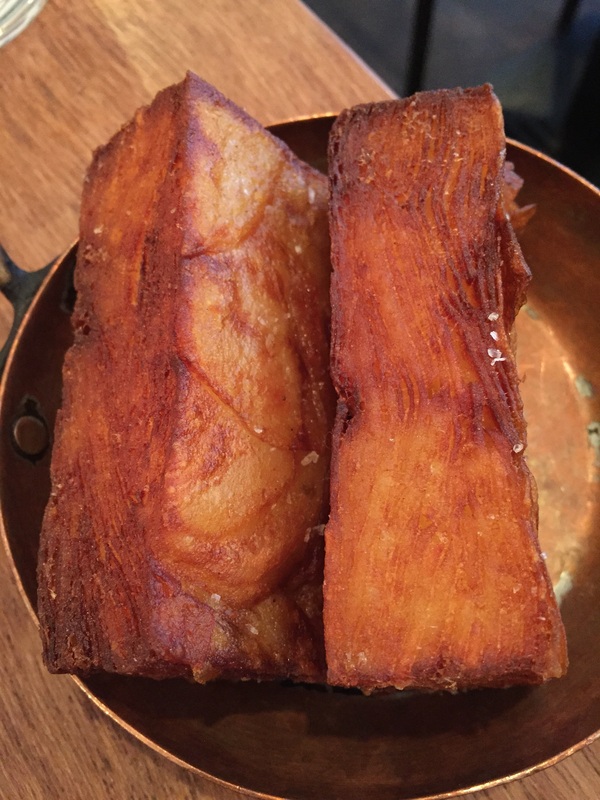 The thinnest slices of potato, deep-fried into two perfect rectangular wedges, these might well be my death-row side dish. C is nonchalant about them and I wonder what sort of man I have married. 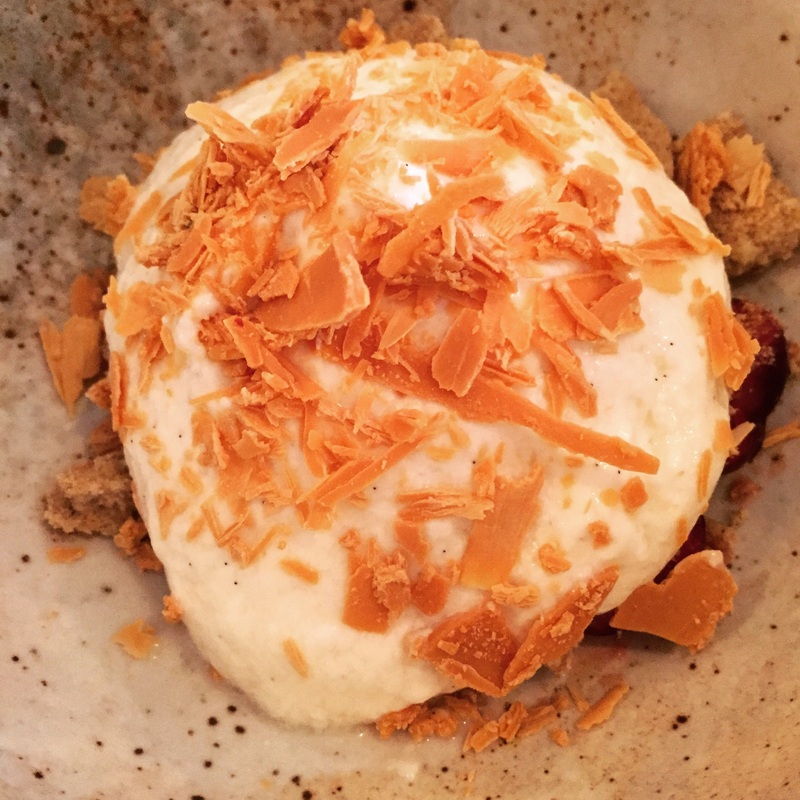 Dessert, a cherry cheesecake, is much better than the yuzu curd, but it’s more a soft foamy cheese than a cheesecake, spooned onto plump juicy semi-sweet cherries, the killer ingredient being the caramelised white chocolate, grated over the top. Caramelised white chocolate is my new object of desire. With the hand of time looming over us, we do not linger and are in and out in just over an hour. I notice that the restaurant is still only half full. Verdict: East meets West in this inventive, interesting restaurant. There are no frills other than those found on a girolle and the food is well-prepared, originally presented and most importantly it tastes great. It isn’t perfect, it isn’t the best restaurant opened in the history of mankind despite the early reviews, but it is a very good choice for those of us who don’t live in Dalston but still want the excitement of new-wave cooking and who care more about the food than the decor, not that I don’t like it, but modern Spartan isn’t everyone’s idea of a comfortable night out. Oh and the wine list is very good, but that’s hardly a surprise. Shaved ox heart. Oh dear God. Crowning glory. Asparagus to you.